The Walter Camp Football Foundation has announced the names of fifteen “Players to Watch” for its 2016 Player of the Year award, the fourth-oldest college football award in the nation. The Walter Camp Player of the Year is voted on by the 128 Football Bowl Subdivision head coaches and sports information directors. A list of five finalists will be announced on Wednesday, November 30, and the winner broadcast live on ESPN SportsCenter on Thursday, December 8. Players from the top six teams in the most recent College Football Playoff rankings are on the list, including quarterback Jalen Hurts and defensive lineman Jonathan Allen from top-ranked Alabama (10-0). Quarterback J.T. Barrett and linebacker Raekwon McMillan from second-ranked Ohio State (9-1) are on the watch list along with all-around performer Jabrill Peppers from third-ranked Michigan (9-1), and quarterback Deshaun Watson from fourth-ranked Clemson (9-1). The 15-player watch list includes eight quarterbacks, three running backs, three defensive players and one wide receiver. Twelve different schools and seven conferences are represented on the list. The 2015 Walter Camp Player of the Year was former University of Alabama and current Tennessee Titans running back Derrick Henry. Jonathan Allen, DL, Alabama, Senior – Has 40 tackles and 7.5 quarterback sacks for the top-ranked Crimson Tide (10-0). J.T. Barrett, QB, Ohio State, Junior – Has accounted for 2,835 yards and 31 touchdowns for the 9-1 Buckeyes. Jake Browning, QB, Washington, Sophomore – Has passed for 2,532 yards and 35 touchdowns for 9-1 Huskies. Dalvin Cook, RB, Florida State, Junior – Has rushed for 1,242 yards and 13 touchdowns for 7-3 Seminoles. Luke Falk, QB, Washington State, Junior – Has passed for 3,610 yards and 33 touchdowns for 8-2 Cougars. Quinton Flowers, QB, USF, Junior – Has accounted for 3,335 yards and 32 touchdowns for the 8-2 Bulls. D’Onta Foreman, RB, Texas, Junior – Leads the nation in rushing (179.2 yards per game) for 5-5 Longhorns. Jalen Hurts, QB, Alabama, Freshman – Has accounted for 2,767 yards and 27 touchdowns for the 10-0 Crimson Tide. 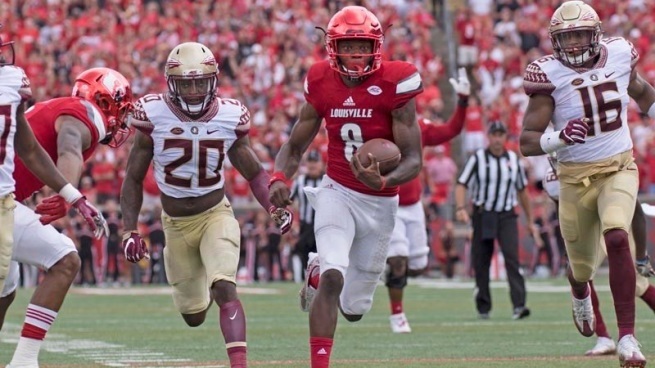 Lamar Jackson, QB, Louisville, Sophomore – Has accounted for 4,232 yards and 46 touchdowns for the 9-1 Cardinals. Baker Mayfield, QB, Oklahoma, Redshirt Junior – Has passed for 3,212 yards and 33 touchdowns for 8-2 Sooners. Raekwon McMillan, LB, Ohio State, Junior – Leads 9-1 Buckeyes with 64 tackles. Jabrill Peppers, DB/RB/KR, Michigan, Junior – Has played 13 different positions for the 9-1 Wolverines. Donnel Pumphrey, RB, San Diego State, Senior – Has rushed for 1,779 yards and 14 touchdowns for the 9-1 Aztecs. Deshaun Watson, QB, Clemson, Junior – Has 3,455 yards of total offense and 29 touchdowns for the 9-1 Tigers. Dede Westbrook WR, Oklahoma, Redshirt Senior – Has 68 receptions for 1,254 yards and 14 touchdowns for 8-2 Sooners.